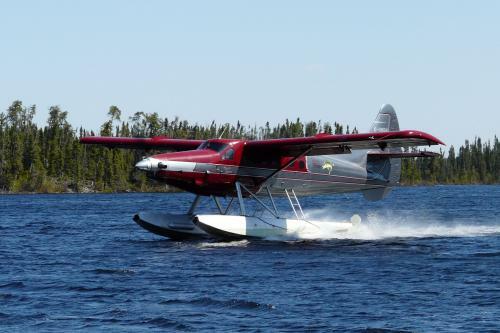 Aircraft | Northern Wilderness Outfitters Ltd.
Operating two turbine and one piston 9 passenger DeHavilland Otter aircraft, we get you to your destination so you can begin your Canadian Fly In Fishing experience. If ever there was an aircraft of immense interest whose exploits have gone, for the most part, unrecorded and unnoticed, it must surely be DeHavilland Canada’s Otter. After DeHavilland Canada demonstrated the Otter to the U.S. Army who were so impressed that they purchased 184 of the 466 Otters built. The U.S. Army called the Otter the UIA Otter! Other military users include Australia, Canada, Chile, Columbia, Costa Rica, India, New Zealand, Nicaragua, Norway, Phillippines, United Kingdom, Ghana, Panama and other military operators around the world. Design work at DeHavilland Canada began on the Otter in January 1951 and it culminated in the type’s first flight on December 12th, 1951. Canadian certification was awarded in November 1952 and ever since it has faithfully served its operators, both military and civil, mostly in remote parts of the world. Despite its many achievements and the great amount of important work it has performed over the years, very little has been written about the aircraft. The Otter was heavily involved in the Antarctic exploration programme of the late 1950’s and early 1960’s, but writings on this topic usually concentrate on other types of aircraft that were involved. It made a huge contribution in many outback parts of the world to their development. In US Army service it was instrumental in mapping and survey work in the Americas, from Alaska all the way south to Chile, as well as in northern Africa and yet these roles are largely unknown. In Vietnam it saw ten years of combat service and yet books on the South East Asian conflict either ignore the Otter completely or mention it only in passing. In its home country, as in Alaska, it must surely be the ultimate bush aircraft and yet it is usually not mentioned. 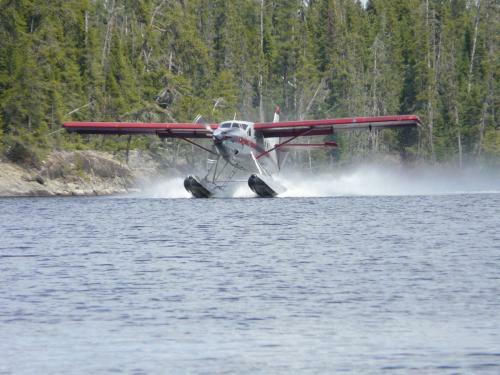 Northern Wilderness Outfitters has operated three of these marvelous aircraft for over 26 years. In these 26 years the three Otters have flown sportsmen over 4 million miles to pursue their passion. Our DeHavilland Otter aircraft with the registration of CG-MDG is a Vietnam Vet. It was born in early 1958 and delivered to the United States Army on December 2nd, 1958. It was allocated to the 17th aviation company, Fort Ord, California. It was delivered from the DeHavilland aircraft factory in Downsview, Ontario to the Sharpe Army Depot in Stockton, California before continuing on to Fort Ord. In January 1962 it was assigned to the 18th Aviation company for deployment to Vietnam, and entered service with the company in Vietnam. It is mentioned in the history of the 339th transportation company: “Recovery at Pleiku, January, 1963”. This recovery took place after an aircraft of the 18th aviation company had to make a forced landing at Pleiku. With the 18th aviation company, CG-MDG carried the code “F” and continued flying for the company until April 1966 when it returned to the United States for general maintenance and overhaul at Corpus Christi, TX. After overhaul, CG-MDG was returned to Vietnam in June 1966 and joined the 54th aviation company. It continued to fly for this company until October 1970, when it was taken on charge by the 56th transportation company. By January 1971 it was with the 166th aviation maintenance detachment, and in April 1971 it arrived back in the United States, at the Sharpe Army Depot, Stockton, CA. It remained at the depot in storage until February 1973 when it was deleted from the Army inventory and put up for disposal as military surplus. The buyer of the Otter was Harold J. Hansen of Seattle. The aircraft was trucked to his facility at Boeing Field in Seattle in January 1975where it was refurbished and civilianized. On July 11th, 1975 CG-MDG was on its way to Alaska where it joined the fleet of Frontier Flying Service in Fairbanks. On September 23rd, 1975 the Otter CG-MDG was on a cargo run for a mining company taking off from the Kuskokwim River en route to Minchumina, Alaska. There was insufficient room for take off and the otter collided with a dirt bank in the river, causing substantial damage to both wings. The company used another Otter to fly a set of replacement wings (which were strapped to the outside of the aircraft) to the Kuskowim River. Temporary repairs were made on site, and the aircraft was flown back to Boeing Field for permanent repairs. After the repairs were made, CG-MDG was then sold to Maxon Aviation out of Kotzebue, Alaska where it flew until it was sold in June of 1980 to Airpark Aviation Ltd., in Lac De Bonet, Manitoba. Airpark Aviation purchased CG-MDG because their Otter CG-QOX had been destroyed when their hangar collapsed in February 1980. Airpark flew the Otter on mining exploration charters and to support their fly in remote fishing camps in Northern Manitoba. In January 1983, Northern Wilderness Outfitters Ltd. bought CG-MDG for $135,000.00. They immediately converted C-GMDG into an amphibious Otter. Wheeled gear was installed in the floats so the Otter could fly off the water as well as an airport. In the summer of 1984, C-GMDG was put into use flying fishermen to their Chantrey Inlet Lodge deep in the arctic circle. Chantrey Inlet Lodge was noted for its huge 40-60 lb. Lake Trout and Arctic Char up to 25 lbs. Their Navijo Chiefton would take 6 fishermen every morning at 5:00 AM from the FortFrances municipal airport and fly them almost 1400 miles straight North to the airport at Baker Lake in the Northwest Territories. The Navijo Chiefton, with its 6 fishermen on board, would land at Baker Lake around 2-4:00 PM. The fishermen would then board the amphibious Otter C-GMDG for the 170 mile flight to Chantrey Inlet. C-GMDG serviced Chantrey Inlet Lodge until 1993 when the lodge became unprofitable because of the transportation costs. As far as we know, the boats, motors and lodge are still there after 15 years! In 1993 the wheeled gear was taken out of the floats as the gear weighed over 500 lbs. and cut into the payload the Otter could haul off the water. In 1997, Northern Wilderness Outfitters converted the piston engine to a Vazar turbine engine and completely rebuilt the air frame on this aircraft at a cost of almost $800,000.00! C-GMDG is still servicing the 21 remote outpost cabins in Northwestern Ontario as well as a large American plan lodge (Moose Point Lodge) on ShikagLake for over 26 years! Otter C-GUTL was born in the spring of 1960 and delivered to the Royal Canadian Air Force on June 16, 1960. It was allocated to 438 Squadron at St. Hubert, Montreal where it served until selected for duty with 117 Air Transport Unit, an RCAF unit formed to support a United Nations mission supervising a cease-fire between India and Pakistan. The Otter flew to Trenton, Ontario on the 23rd of September ’65, taking up temporary residence with 102 Communications Unit, and was then loaded on board an RCAF Hercules and flown to Lahore in Pakistan, where it arrived on the 6th of October, 1965. The Otter C-GUTL was flown back to Canada in April 1966, again on board the Royal Canadian Air Force Hercules. After re-assembly by No. 6 Repair Depot, C-GUTL was assigned on November 18th, 1966 to No. 4 Operational Training Unit in Trenton, Ontario. This unit was re-designated 424 Transport & Rescue Squadron in November 1968, remaining based in Trenton. The Otter was noted on detachment at Goose Bay during June 1969. It continued to serve with 424 Squadron until transferred to 401 Squadron. It continued to serve with 401 Squadron at St. Hubert on June 22nd, 1970. On the 28th of June, 1972 it went into storage at the Mountain View Depot until the 6th of August, 1974 when it was assigned 402 Squadron at Winnipeg, Manitoba. On December 22, 1975 C-GUTL was transferred back to St. Hubert and re-joined 401 Squadron. It continued to serve with 401 squadron until the 9th of December, 1981 when it was flown to the Mountain View Depot and put up for disposal by the Canadian Military. C-GUTL was sold in an auction in February 1982, with a total airframe time at that stage of 6,576 hours. The buyer was Nahanni Air Services Ltd. Of Norman Wells, Northwest Territories, to whom the Otter was registered in February 1983. The Otter was leased by Northern Wilderness Outfitters Ltd., out of Fort Frances, Ontario for the summer of 1983. A company in Columbia then agreed to purchase the aircraft from Nahanni Air Services. The proposed purchaser had the exotic name of Aerolineas de la Orinoquia & Amazonia Limitada and in early 1984 paid a deposit for the aircraft and obtained a Columbian registration. C-GUTL was to become HK-3048X. The otter was made ready for delivery, but the final payment was never made and nothing more was heard from the would-be purchaser. After this sale had fallen through, C-GUTL was sold to Fort Frances Sportsmen Airways Ltd., of Fort Frances, Ontario for $150,000.00 to whom it was registered in April 1984. The piston Otter, with a 600 hp Pratt & Whitney R-1340 (1340 Cu. In displacement) nine cylinder, air cooled, super charged radial engine sank at the dock during a storm in the spring of 1998. It was then totally rebuilt and converted to a Vazar Turbine Otter at a cost of over $800,000.00. C-GUTL carries Northern Wilderness Outfitters titles, a company associated with Fort Frances Sportsmen Airways, Ltd. It is used during the summer months to fly fishermen and tourists to remote fishing and hunting camps and is still in service, over 25 years after first being delivered to FortFrances! Otter C-GBQC was also born in the spring of 1960. It was delivered to the Royal Canadian Air Force on the 14th of November, 1960 with the serial number 9420. It was assigned to 442 Squadron at the RCAF Station Sea Island, Vancouver on amphibious floats. It was to serve the Squadron for over three years. In July, 1961 it deployed to Yellowknife, to support a visit to the Northwest Territories by the Canadian Prime Minister. The visit was being arranged by 111 Communications & Rescue Flight at Winnipeg but they needed an amphibious Otter. Accordingly, a 111 C&R crew went to Vancouver and borrowed C-GBQC which, as far as they were concerned, was “VIP Otter”. C-GBQC flew from Winnipeg to Yellowknife. On July 19th, 1961 the Prime Minister and Mrs. Diefenbaker were flown on C-GBQC from Yellowknife to Snare River and back the next day. Its VIP duties over, it returned to Sea Island, BC. On October 13th, 1962, C-GBQC suffered some damage due to a wind storm and on December 12th, 1962 the aircraft force landed on the ocean 10 miles from Nanaimo on Vancouver Island. Two Albatross aircraft from 121 Rescue Unit went to the assistance of the Otter, which was towed by boat to French Creek dock for repair. On May 2nd, 1963, C-GBQC sustained damage to its starboard float. In the course of a training detail, the new pilot was practicing rough water landings. On the first practice landing the aircraft struck hard, bounced and the captain took over from the student and applied full power. The aircraft stalled, but the power succeeded in cushioning the next touchdown which was gentle. A normal take off was made from calmer waters and flown back to base. C-GBQC was then flow to the Canadian Pacific Airlines depot at Lincoln Park in Calgary, Alberta for repair of the buckled float, before returning to Squadron 442. On February 21, 1964, C-GBQC was transferred to Squadron 411 and flew across Canada to its new base in Downsview, Ontario where it served for the next 17 years. On June 25th, 1966, while at Downsview, it suffered another training incident. The pilot was taxing on a lake when the floats came in contact with a sunken reef. The water was dark brown, which made it difficult to spot submerged reefs. Temporary repairs were carried out and C-GBQC was flown back to base where the necessary permanent repairs were made. On September 26th, 1974, the military was making a low level navigation exercise from their base in Downsview when the aircraft came in contact with some wires. Although 3 feet of the vertical stabilizer and the entire rudder were lost, the experienced pilot managed to land the Otter at a base in Kingston, Ontario. Again, the necessary repairs were made and C-GBQC continued to serve 411 Squadron until February 17th, 1981, when it was withdrawn from service and went into storage at the Mountain View depot in Ontario. The Otter was put up for disposal through the Canadian Government Assets Disposal Corporation and was one of a number of Otters for sale by auction in February 1982, advertised as having 5,458 hours on the airframe. 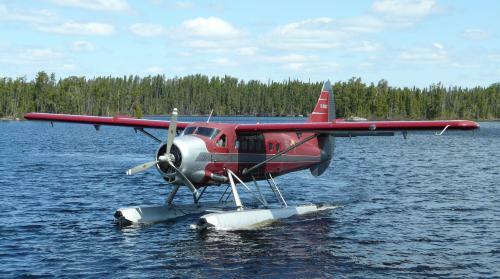 The purchaser of the Otter was Ram Air Charter Ltd. of Inuvik, NWT to whom the aircraft was registered in July, 1982. The Otter flew for Ram Air during 1982 and ’83, but by early 1984 was parked at Inuvik and for sale. It was sold to Fort Frances Sportsmen Airways Ltd. of Fort Frances, Ontario to whom it was registered in June 1984. This company is associated with Northern Wilderness Outfitters, serving fishing lodges in the Ontario outback for over 25 years, and ‘BQC is still flying for the company, still based at FortFrances. © 2017 Northern Wilderness Outfitters.